This week we focused on antibiotic sensitivity on the individual bacteria that were identified last week. 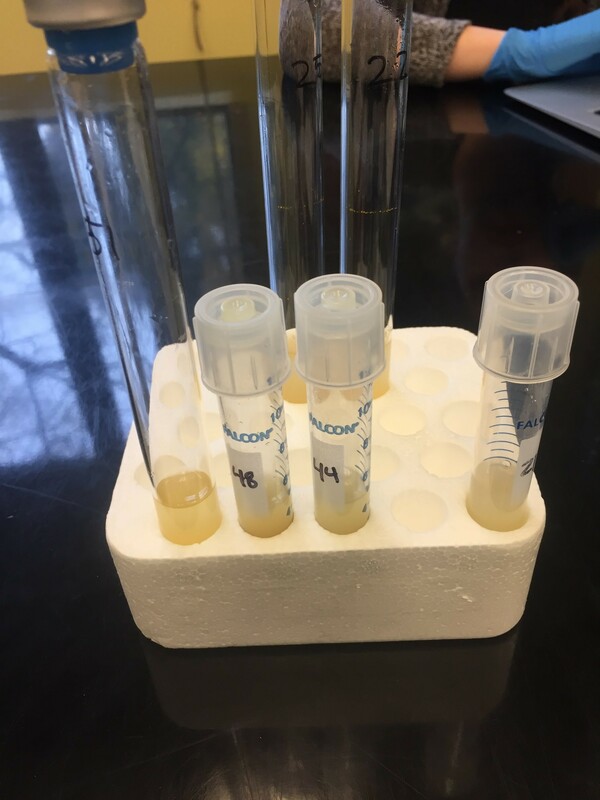 The day before class, the bacteria that we have been working with all quarter were recultured in their original conditions. They were grown in a liquid media to be easily transferred onto new plates in lab (Picture 1). 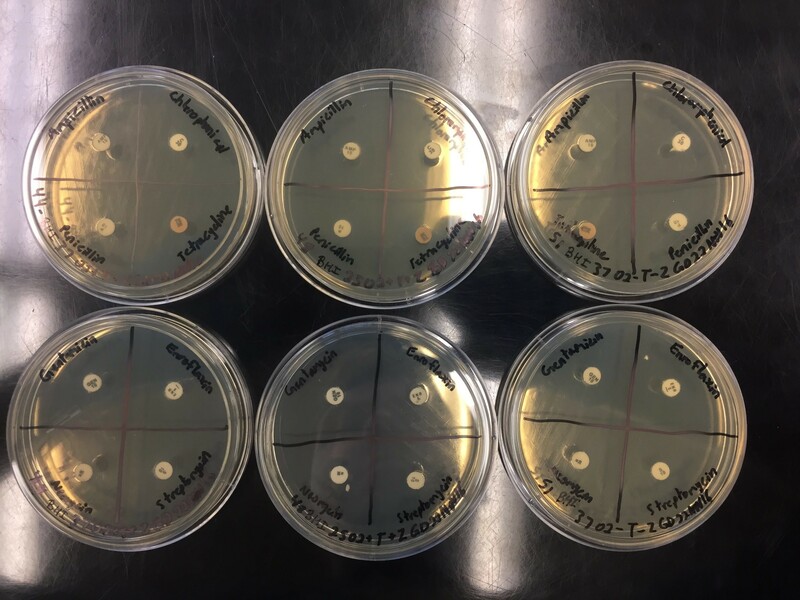 In order to test the antibiotic resistance of each bug, we performed what is called a modified Kirby Bauer test. This test is widely used among microbiologists when testing bacteria for any antibiotic resistance. The bacteria are grown in liquid culture, then placed on an agar plate (LB or BHI) that has been divided into four sections. Each section of the plate then has a small disk that is saturated with a specific antibiotic placed on top of the agar (Picture 2). The antibiotics disks we used were Ampicillin, Chloramphenicol, Tetracycline, Penicillin, Gentamicin, Enrofloxacin, Neomycin, and Streptomycin. 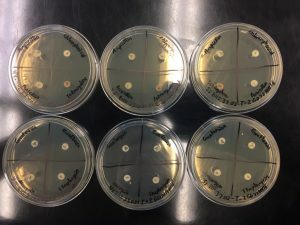 The plates are then left to culture and grow. All this was done to test the antibiotic resistance of each bacteria. 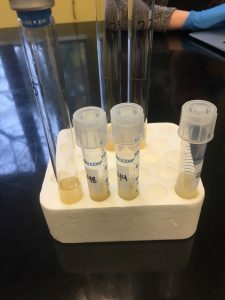 We wanted to know which tannin degrading bacteria are susceptible to antibiotics to see if the treatments the koala’s have been receiving are responsible for the koala deaths being observed. If the bacteria are antibiotic resistant then the treatments should not be responsible for the deaths. However, if some of the tannin degrading bacteria are not resistant, than it is likely that the antibiotic treatments being given to the koalas is killing of the tannin degrading bacteria. If these bacteria are killed off, then the koalas cannot digest the tannins and are basically being poisoned. The lab this week is the final test on our bacteria and the chance to see if all our hard work the past ten weeks is going to pay off! Even though researchers are currently in the process of creating a vaccine to protect the endangered koala populations. We wonder, what more can we do to preserve the koala population as we observe that their numbers are declining? You performed what is known as a changed Kirby Bauer test. This test is generally utilized among microbiologists when testing microscopic organisms for any anti-microbial resistance.